6-92: Who are your friends. Alright, last page of the chapter. What’s this guy’s deal? We’ll have to wait to find out. Chapter 7 is going to start in probably late January or early February. I’d be more specific but honestly I’m an emotional mess right now. I’ll make an announcement once I know exactly when it’s coming back on tumblr and twitter. The great brother reveal! And he looks cocky af. 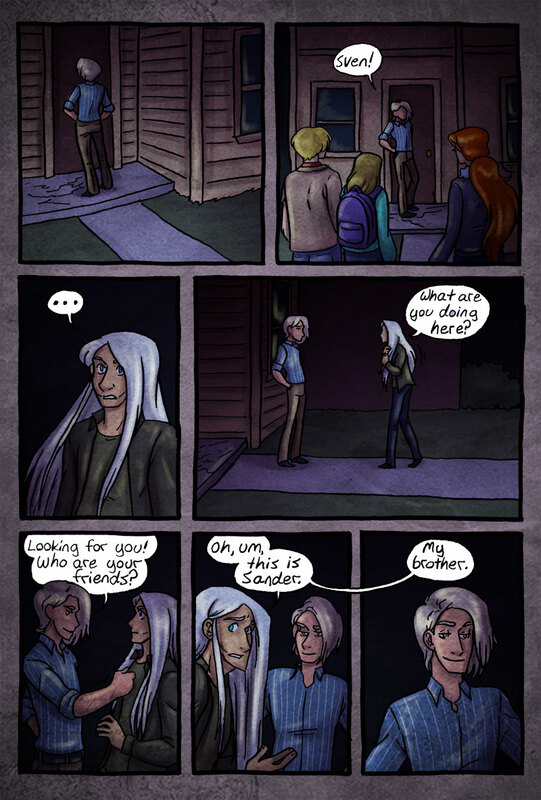 Sander’s face in the last panel: Yeah that’s right, I’m Sander, Sven’s brother, you’re welcome. Kinda reminds me of Gabry. …Now I want a comic with nothing but Gabry expys. Omg, forget the hot sister, look at that hot brother! he has a whole pack . Thank you! The comic usually updates on Mondays. It was Monday and Wednesday but I’m having to drop back to one update a week for a while. Right now the comic is on a break between chapters but it’ll be back in February.